If we’ve learned anything at all from the recent political tumult, is that words do matter. So, what are we to make of the word “alternative?” A nit-picky lexicologist would likely say that you can have a maximum of two alternatives, because the word derives from the Latin alter, meaning “other (of two).” In modern standard English, however, the word often describes multiple choices. So it is with investments. There’s no one alternative to the traditional 60/40 mix of equities and fixed-income securities. Choices abound, from commodities to hedge funds, including all manner of long/short strategies. Which, then, are the best alternatives? Not as stand-alone investments, but as to complement a conventional asset allocation. Why might we need an alternative investment in the first place? We need some yin to balance against our existing portfolio’s yang. While common stocks are generally not well-correlated to bonds, there are times when both asset classes get simultaneously hit. That’s when an alternative ought to keep a drawdown from becoming catastrophic. This is especially important when we head into a period of exceptional instability for both stocks and bonds. Alternative investment strategies have been around in hedge fund form for many years. Their appearance in exchange-traded wrappers is a more recent phenomenon. Of those exchange-traded products that have survived at least five years, Morningstar credits only a handful of alts with positive alpha. The roster of alpha producers (Table 1) contains a surprise that will undoubtedly leave many investors incredulous. 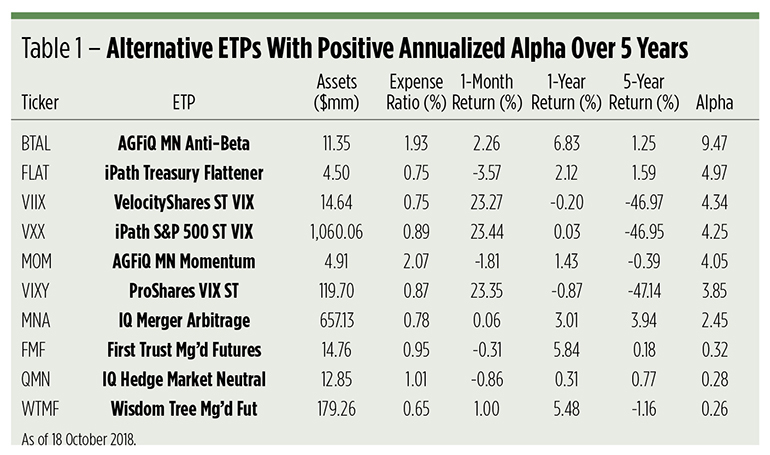 It’s the appearance of ETPs tracking short-term VIX futures—notorious for their big-time losses. VIX, or the Cboe Volatility Index, is the stock market’s so-called “fear gauge.” VIX tends to spike as traders price higher and higher volatility into the index’s underlying S&P 500 option premiums. VIX futures are used mainly by institutional traders to defend against broad market wobbles. These hedges are tactical, not long-term positions.